A study in Dhaka,  capital city of Bangladesh, revealed 2.6-fold reduction in diarrheal episodes in the intervention area following the practice of regular hand washing with soap and water. Under these circumstances, this study had been conducted with the objectives to study the hand washing practices followed in two communities having similar sociocultural and linguistic background situated in two states of Eastern India and to assess and compare the status of different components of hand washing at the pre- and postintervention phases. The study was a community-based interventional pilot study conducted, in one area each in, two states of Eastern India, namely West Bengal and Tripura, which have close similarity in linguistic and sociocultural aspects, although situated nearly 1000 km apart. From West Bengal, an urban slum of Sibpur area (Howrah district) was selected as the study area where source of water supply was intermittent tap water. In Tripura, the study area was an urban slum of South Chandrapur area (Agartala Township) where water was used from pond, tube wells, and wells. A baseline study regarding hand washing practices was carried out followed by concurrent intervention at the last week of September 2007 at Howrah and during the last week of November to first week of December 2007 at South Chandrapur area of Tripura. Due to operational problems, the study in both the places could not be conducted simultaneously. The evaluation was done in January 2008 in both the places. As the evaluation was not done with a uniform time gap after intervention in both the places, a second intervention followed by evaluation was done with a gap of 1 month at Sibpur to maintain uniformity with south Chandrapur. Thus in the study area of Sibpur, second evaluation was carried out in February 2008. Although some bias still remained, but could not be avoided due to operational constraints. Sample size was purposively taken as 100 households due to constraints of funding and operational feasibility. However, the first household was selected by simple random sampling and then selecting 100 households consecutively till the final sample size was achieved. The absent and reluctant households were skipped during the survey, and subsequent household was selected for the study. A total of 100 households in each of the two study areas were studied during the baseline survey as well as for intervention. Study techniques consisted of interview of the respondents with a predesigned and pretested pro forma and observations of different aspects of hand washing, as per IFH guidelines,  such as material used for hand washing, time of hand washing (stopwatch used), six steps of hand-washing, and hand washing mainly after defecation. All these components with correct methods were taught to the respondents through interpersonal communication for behavioral changes as part of the intervention, concurrently at the time of the baseline survey. These activities were performed by some field level workers trained beforehand and under the direct supervision of the investigators. The same respondent was studied in the baseline and final evaluation. The analysis was done using SPSS 16.0 version. In both the study areas of Sibpur and South Chandrapur, 100 households were covered during the preintervention phase. However during postintervention phases, in Sibpur, only 78 households could be covered due to nonavailability of the person assessed during the preintervention phases, shifting to other areas due to migration and occupation, deaths, and refusal; however in south Chandrapur, all the 100 households of preintervention phases were covered. In Sibpur, the source of water was intermittent water supply from the municipal tap which was stored in the bucket for hand washing. In south Chandrapur, water used was mainly from ponds (52%), tube wells (26%), and wells (22%). In south Chandrapur, the majority of the respondents washed hands with stored water from the bucket (89%) and not much variation (74%) could be observed following intervention. Hand washing by water directly from the tap in Sibpur increased from 11% during the baseline survey to 43.58% during first intervention and finally to 61.54% during second intervention, and the differences were found to be significant in both the phases (P < 0.05). This was accompanied by a marked decline in the use of bucket water, i.e. from 88% at the time of the baseline survey to 41% after first and 25% following second intervention (P < 0.01). Regarding the situations where the respondents actually practiced hand-washing, findings of South Chandrapur and Sibpur did not show much difference. In both the studied areas, hand washing after defecation was practiced by almost all the respondents. However it was concerning to note that in both the areas hand washing was not practiced by a substantial proportion of the respondents in situations such as "after changing babies' nappies and "disposing off their faeces", "before preparing food", "immediately after handling raw vegetables", and "after handling pets and domestic animals" [Figure 1]. 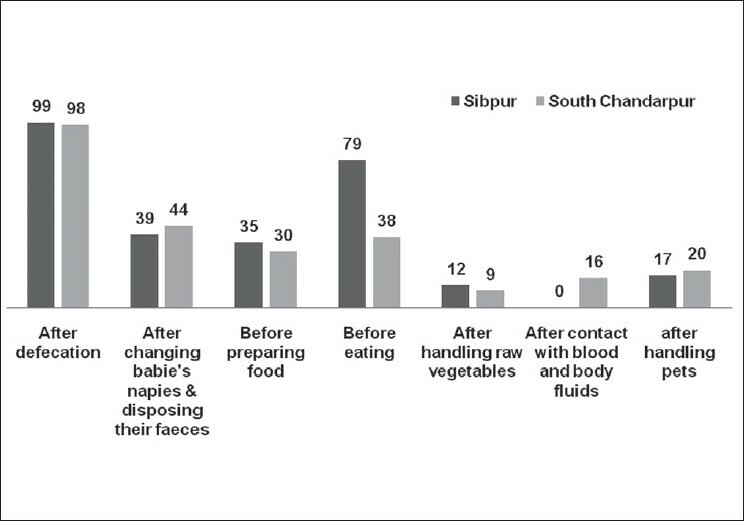 Use of soap for hand washing during both pre- and postintervention phases was observed to be much higher in Sibpur (92%, 98.75% and 97.4% in baseline, first and second interventions, respectively), but in South Chandrapur, it had improved from baseline 65% to 98% following intervention and the difference was found to be statistically significant (P = 0.000). At south Chandrapur, some of the respondents used plain water and ash for hand washing mainly after defecation, during the baseline survey. The baseline survey revealed that only 11% of the respondents were washing their hands for more than 15-30 s in Sibpur, which was improved significantly to 25% and 42% after the first and second interventions, respectively (P = 0.009 and P = 0.02). None of the respondents at south Chandrapur washed hands for this stipulated time period both before and after intervention. In both the areas, none of the respondents followed all the six steps of hand washing before intervention. Following intervention, improvement was observed to the extent of 44% in south Chandrapur; whereas in Sibpur, it was 17.9% and 47.4% after the first and second interventions, respectively, and the difference was found to be significant (P = 0.000). The majority of the respondents (>95%) in both the study areas were found to be practicing step 1 of hand washing in the baseline survey. However, there was significant improvement in other steps of hand washing in both the areas following interventions and it was more in regards to steps 2, 3, 4, and 6 [Table 1]. It was observed during the baseline survey that only 42% of the respondents in Sibpur used clean material for drying hands after hand washing, and it had significantly improved to 67.9% (P = 0.001) after first intervention; though not changed much following second intervention (66.6%). In South Chandrapur, 37% and 93% of respondents used clean material at pre- and post-intervention phases, respectively, and the improvement was found to be significant (P = 0.000). This study observed little differences in between two study areas in respect to the practice of hand washing. Almost all of the respondents practiced hand washing after defecation, but it was concerning to note that in both the areas, hand washing was not practiced by a substantial proportion of the respondents in situations such as "after changing babies' nappies and disposing off their faeces", "before preparing food", "immediately after handling raw vegetables", and "after handling pets and domestic animals". The reasons might be due to the similarity in sociocultural and linguistic background of the study areas. Earlier studies by Ray et al. also highlighted similar findings. The majority of the people wrongly considered child's feces to be free of germs. A community-based behavior change communication program on these important issues should be taken up so that the knowledge and practice of the respondents could be improved. In one study area, the majority of the respondents washed hands with water stored in buckets and no change following intervention was observed due to nonavailability of tap water supply in that area. Whereas, washing hands with running water from tap improved significantly in another study area following interventions wherever such facilities existed close to the household. The study revealed that repeated interventions as well as availability of facilities for running water were required to improve the practices of hand washing. BCC activities with involvement of health and Integrated Child Development Services (ICDS) functionaries could help in its sustainability. This study observed use of plain water and ash for washing hands in the study area situated in Tripura in the baseline survey, which might be due to the age old habits of hand washing in the area. However following intervention, it was significantly improved to use of soap and water. Interventions might have resulted in a changed and improved behavior, but question remains regarding sustainability in future. In the study area of West Bengal, use of soap for hand washing (92%) was more observed during the preintervention phase, which was sustained subsequently. The intervention study at Jerusalam  revealed that there was threefold increase in hand washing with soap among preschool children, exposed to the intervention. In this study the majority of the respondents were not washing their hands for more than 15-30 s as recommended by IFH  in both the study areas, although improvements were observed in one study area following intervention. Ray et al. also revealed the practice of hand washing for less than 10 s in their earlier study. Whatever might be the material used for drying, it was important to know whether it was clean or not. This study observed marked improvement in using clean material for drying hands following intervention compared to the baseline survey. Use of soap, cleanliness of material for drying hands, time and steps of hand washing were important components of hand washing. Even if 100% of the population washed hands after defecation as well as after other situations, diarrhea, ARI, etc. could not be reduced, if these components of hand washing were ignored. Hand washing is a neglected issue both by the community and care-providers (including government). Its enormous importance in prevention and reduction of occurrence of diseases such as diarrhea, ARI and skin infections, based on the evidence, was not properly understood and thus priority has not been given by the community and government to that extent as given for other programs such as immunization, ORT, RCH, etc. Based on the findings of this intervention study, it could be suggested that BCC program should be well planned with emphasis on hand washing after changing nappies and disposal of child's faeces, handling pets and animals, before preparing food, etc. If running water is not available, water may be used from the bucket, but bucket should be clean and pond water should be kept in the bucket after treatment. Usage of soap, hand washing for 15-30 s following all the six steps, drying of washed hands with clean towel or a piece of clean cloth should be emphasized. Repeated intervention at frequent interval is required to have a sustainable effect. 1. Labarraque AG, Porter J, Baldwin CT. Instructions and observations regarding the use of the chlorides of soda and lime. New Haven and Treadway; 1829. 2. Semmelweis I. Etiology, concept, and prophylaxis of childbed fever. In: Carter KC, editor. Madison: The University of Wisconsin Press; 1983. Available from: http://www.inventors.about.com/library/inventors/blantisceptics.htm [last cited in 1983]. 3. Stone SP. Hand hygiene - the case for evidence-based education. J R Soc Med 2001;94:278-81. 4. Curtis V, Cairncross S. Effect of Washing Hands with soap on diarrhea risk in the community: a systematic Review. Lancet Infect Dis 2003;5:275-81. 5. Cairnross S. Editorial: Hand washing with soap - a new way to prevent ARIs? Trop Med Int Health 2003;8:677-9. 6. Luby SP, Agboatwalla M, Feikin DR, Painter J, Billhimer W, Altaf A, Hoekstra RM. Effect of handwashing on child health: a randomised controlled trial. Lancet 2005;366:225-33. 7. Sircar BK, Sengupta PG, Mondal SK, Gupta DN, Saha NC, Ghosh S, et al. Effect of handwashing on the incidence of diarrhoea in a Calcutta slum. J Diarrhoeal Dis Res 1987;5:112-4. 8. Ray SK, Dobe M, Maji S, Chakraborty D, Sinha Roy AK, Basu SS. A pilot survey on hand washing among some communities of West Bengal. Indian J Pub Health 2006;50:227-30. 9. Shahid NS, Greenough 3 rd WB, Samadi AR, Huq IM, Rahaman N. Handwashing with soap reduces Diarrhoea and spread of bacterial pathogen in a Bangladesh village. J Diarrhoeal Dis Res 1996;14:85-9. 10. The International Scientific Forum on Home Hygiene (IFH). The effectiveness of hand hygiene procedures including hand washing and alcohol-based hand sanitizers in reducing the risks of infections in home and community settings. Available from: http://www.ifh-homehygiene.org/2003/ICNA-TRAINING-RESOURCE-BOOKLET.pdf [last cited on 2007]. 11. Rosen L, Manor O, Engelhard D, Brody D, Rosen B, Peleq H, et al. Can hand washing intervention make a difference? Results from a randomised control trial In Jerusalem preschools. Prev Med 2006;42:27-32.